After much speculation and many flying rumors, the Japanese government stepped in on Wednesday, Sep. 15 and intervened − sell yen, buy dollar − for the first time in six years. The yen has risen about 10% against the dollar this year, and had just reached yet another new 15-year high against the U.S. dollar, and an eight-year high against the euro, on Tuesday, Sep. 14. In the context of a slowing economy, the rapid rise of yen is bad news as it hurts exports, stalls domestic consumptions, and further aggravates the existing macro-problem (see graph). Toyota Motor Corp. estimates that every 1-yen climb versus the dollar saps 30 billion yen, or $351 million, from earnings. Sadly but truly, as dismal as Japan’s economic outlook seems, the yen (along with Swiss franc) is replacing the U.S. dollar as the safe-haven currency with the continuing unwinding of risk trades. Investors see the yen as “safe” due to the fact that Japan has a current account surplus and its government debt is mostly domestic instead of foreign. Moreover, the prospect of slowing growth in the U.S. and talk of the Fed’s continuing quantitative easing − driving interest rates even lower − further discourage dollar holding. Generally, a country’s currency value rises with a healthy GDP growth, but in the case of Japan it is quite the opposite. Despite Japan’s ongoing current account surplus, a currency out of line with fundamentals could pose risks to its stability. Some analysts are now worried about a possible global race of devalue to prosperity as other countries with appreciating currency may follow Japan’s lead. Reuters reported that already Colombia’s central bank had said it was starting to buy at least $20 million daily to slow the rise in its peso currency, and Brazil indicated it wouldn’t stand by if others weakened their currencies at Brazil’s exporting expense. Thailand, with its baht setting a series of 13-year highs against the dollar this month, is the next most likely to jump into intervention. The Philippines has also threatened as its peso hit a two-year high against the dollar. Other Asian countries are also no strangers to the currency game, with South Korea and Taiwan among the most active. Reversal of fortune into crisis? In its Asian Development Outlook 2010 published this April, the Asian Development Bank (ADB) noted the speed and strength of the recovery in developing Asia, and low interest rates in developed countries, were prompting “huge” short-term capital inflows. The good news is that so far there have been no immediate large-scale reactions by other central bankers as most developing countries tend to focus more on the dollar exchange rate and thus are not yet too excited about the yen’s movement. So, will this yen intervention work for Japan? Typically, market factors and forces behind a currency appreciation that’s out of sync with fundamentals are too strong to be countered by the act of currency intervention alone, and often with unintended consequences. The Swiss National Bank (SNB), for instance, started buying euro earlier this year trying to halt the rise of the Swiss franc. Well, the franc has continued to appreciate regardless, and hit an all-time high against the euro in July. Since then the SNB has been offloading euros, pushing the franc even higher against the euro. There is speculation that the SNB could intervene again, but due to the lesson learned not long ago, the SNB should be more inclined to look to other instruments to temper the franc. 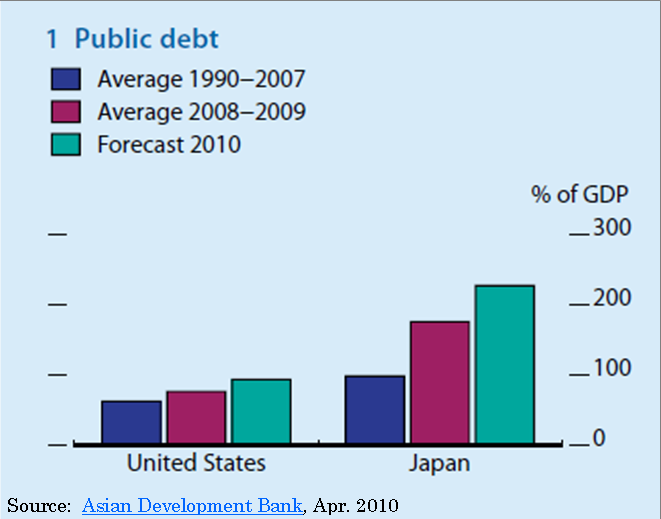 As for Japan’s own track record, it is just as unimpressive. 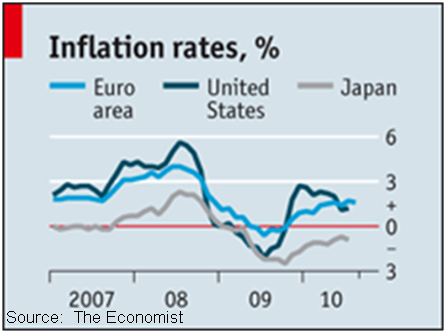 Its last intervention six years ago also failed to halt the yen’s appreciation despite a 15-month dollar shopping spree. Furthermore, unilateral intervention is not as effective as a coordinated one with supports from other central banks. However, as it stands, don’t expect the United States and Europe (or anyone else for that matter) to act too kindly towards Japan’s solo act amid an ongoing currency row with China. As for the yen itself, the intervention succeeded as the currency fell 3%, the biggest one-day move against the dollar since the financial crisis. But the bigger question is whether this will achieve the ultimate goal − pushing export and domestic price levels high enough to help fight deflation − which has plagued the country for a decade. Japan’s intervention war chest is estimated at 2 trillion yen, and officials have already said more action could be expected, suggesting Japanese authorities are in it for the long haul. However, currency intervention alone is unlikely to be the magic bullet for the fundamental and structural issues of Japan’s macro-environment (see charts), which are still under intense debate among many experts and economists, and warrant an entirely separate discussion. 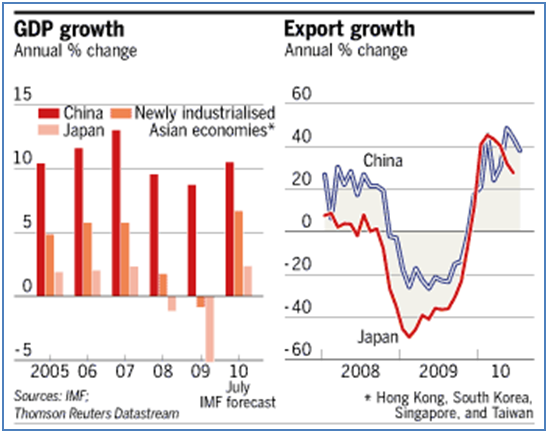 Source: Dian Chu, Economic Forecasts and Opinions, September 16, 2010.